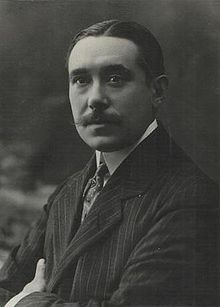 Joaquín Turina (born in Seville on 9 December 1882; died in Madrid on 14 January 1949) was a Spanish composer. Turina was brought up in Seville, and the music of this town always had a big influence on his music. His father was a painter. As a small boy Turina’s favourite toy was a small toy accordion. He started to study medicine, but he wanted to be a musician, so his father let him study music instead. He had piano lessons with Enrique Rodriguez and studied harmony with Garcia Torres, who was in charge of music at the cathedral in Seville. Soon Turina started to compose. He met Falla and the two musicians became lifelong friends. He moved to Paris in 1905 where he studied with Moskowski and d’Indy. One of the his first works to be performed was piano quintet. The style was similar to César Franck. Albéniz heard it and advised the young composer to make his music sound Spanish. Turina’s music started to be performed widely. In 1914 both Turina and Falla returned to live in Spain. They were two of the most important Spanish composers. He was choirmaster at the Teatro Real and he had an opera Jardin de oriente performed there. He became director of the Madrid Conservatory and received many honours. He died after a long illness. Turina’s music always sounds very Spanish, although he used the forms of main European composers. He wrote many short piano pieces which often describe a person. He wrote songs and guitar music. This page was last changed on 29 May 2014, at 14:37.